Walt Disney World is known as a destination that requires advance planning. Many people will swear up and down that it’s not worth booking a trip if you don’t plan it all out and book it completely at least 180 days in advance, assuring that you will get all of the most coveted dining reservations, best Walt Disney World hotel rooms, and first choices on your Fast Passes. While I agree advance planning has its benefits, there are also times when planning isn’t totally necessary. I’m a big fan of the last-minute Walt Disney World vacation experience. Granted, as a family we have visited Walt Disney World a little more often over the past few years than most of my friends living here in Chicago, so my perception of what makes a great day at the park may vary from that of a first timer. However, after a variety of both planned and spontaneous Disney trips, I think we’d all agree that our trips to Disney Parks that have been planned a week to as little as just 24 hours in advance are truly the trips we remember as the most thrilling. 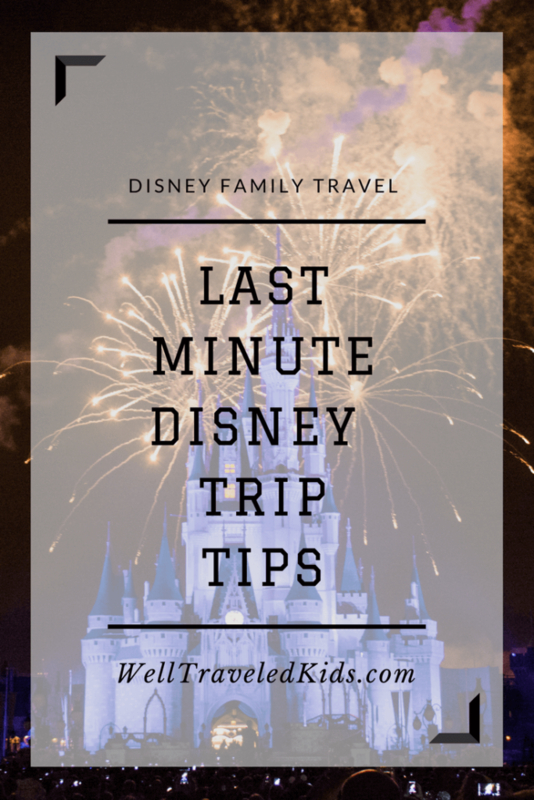 Why book a spontaneous last minute trip to Disney World? Lots of reasons! Maybe you had a beach vacation planned and the forecast called for rain or cold weather. Perhaps you found cheap airfare to Orlando that you just couldn’t pass up. Maybe you are huge Star Wars fanatics and decide you can’t wait another day to get autographs from Darth Vader and Chewbacca. Or you simply decide last minute that your family all needs to see Mickey Mouse at the Most Magical Place on Earth ASAP! Planning a spur of the moment visit to Walt Disney World is totally doable. Don’t listen to the Debbie Downers and neighsayers. Simply remember to think positive, brush on a little pixie dust, and make a wish upon a star that your family will have a magical visit! Here are my tips for making your last-minute Disney Parks adventure a success. Set your family up on My Disney Experience: Assign the days that you plan to visit each park, and select fast passes. Going last minute, you need to be ok with the fact that you will have very limited options on fast passes, but there will be some options. Pick the best three options you are offered for each park, and if possible schedule them for after lunch during the most crowded times of the afternoon. When looking at the calendar and deciding which parks to visit each day, avoid picking parks when they offer “Extra Magic” early morning hours if possible. Those attract a very early crowd from the Walt Disney World Resorts, making it difficult for you to make the most of your morning—and the rest of your day. 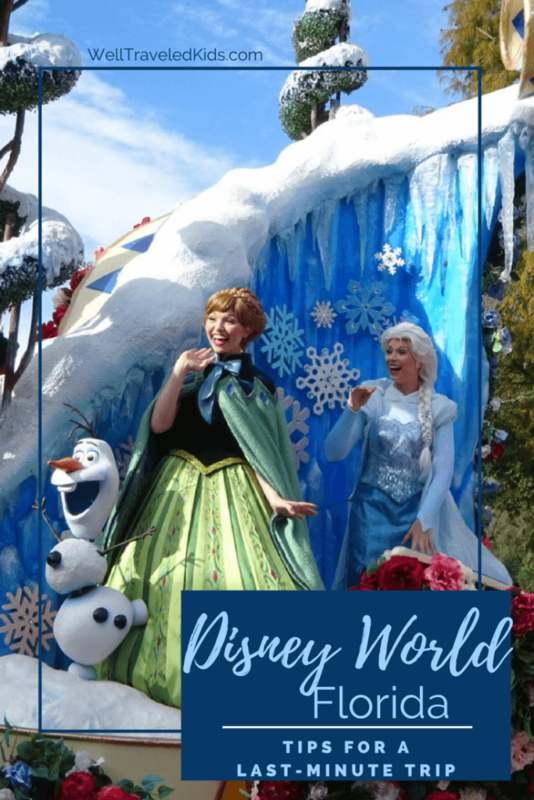 If you are visiting in September through December, see if you can book a last-minute Walt Disney World holiday party ticket offered on select dates. We love Mickey’s Not So Scary Halloween Party and Mickey’s Very Merry Christmas Party for the intimate, light crowd experience and holiday festive vibe. This is key for monitoring your fast passes, Disney dining, memory maker photos, and attraction wait times easily. I also find it an addictive way to grab last minute dining reservations and snag alternate fast passes a few days ahead of the trip. Sometimes the best hotel deals can be found right when you need them. Walt Disney World Resorts may be booked, but if you are looking for a specific hotel, it’s worth a call to see if they have any cancellations you aren’t seeing on the official Walt Disney World Hotels website. During peak season, if prices are high, consider using hotel brand or frequent flyer points (if you have them). We like to use our Hilton points and stay near the parks at either the Waldorf Orlando or the Hilton Bonnet Creek. Starwood points are perfect for a last-minute stay at the Walt Disney World Swan or Dolphin hotels. If you are staying at an official Disney Resort, you can sign up to have the Disney Magical Express busses pick you up at the Airport and take you to your hotel. Then, use complimentary Disney transportation to shuttle you to the parks. It’s been my experience that rental cars are always inexpensive in Orlando, and we often prefer to have our own ride. Keep in mind that parking at the parks and in non-Disney resorts often comes with a price tag. On our last trip, we relied on Uber to shuttle us around to the parks. This was an awesome and inexpensive way to enjoy everything without the hassle of paying to park our own car or traveling with the masses during busy times on the Disney shuttles. We rode in clean and safe cars, and met several friendly Disney enthusiast drivers. I’d highly recommend downloading the Uber app to your phone ahead of time if you chose to go this route so that you are all set with your transportation. As long as you aren’t traveling with a huge party on your last-minute trip, this isn’t as difficult as you might think. I recommend checking the website and then calling Disney Dining directly to make your dining reservations. The Disney folks on the phone are super friendly and if you tell them your dates and times, they will tell you all of your options. Don’t worry if not much is available; keep watching—especially between seven days and 24 hours of your desired reservation time. The sweet spot is between 48 and 24 hours of your desired time. Lots of people cancel during those times, enabling you to swoop in and snag their reservation. I love scanning the My Disney Experience app on my phone, hunting for day-of dining reservations. We’ve had amazing luck time after time booking desirable reservations at places like California Grill and Chef Mickey. I’ve also been lucky to book last-minute experiences like Mickey’s Backyard BBQ and Disney’s Pirates and Pals Fireworks Voyage. Can’t get any of your desired dining reservations? No sweat! Find a quick service restaurant that meet your family’s needs, and spend more of your time on the rides. Harry loved the Darth Vader Chicken and Waffles, complete with the Boba Fett and Han Solo souvenirs we picked up at Hollywood Studios quick service lunch experience. Make a plan to arrive early to the parks so you can be there for the park opening. Prioritize riding your favorite rides that may have long lines later in the day. By doing those first, you’ll be sure to beat the heavy crowds. Set realistic expectations, and if you don’t have fast passes to all of your desired rides, be ok with either waiting in lines or skipping them for other experiences. Be flexible, this is going to be fun! Monitor wait times on your My Disney Experience app so you can zig zag around the park without standing in long lines. Spend your day leisurely watching shows, get down with your favorite characters at a dance party, catch the parades, and light up your nights with amazing fireworks. Let the kids run through the splash areas and play on the themed playgrounds for a bit, instead of waiting in long lines. Take your little gamers over to Main Street, and fight villains in the Sorcerer’s of the Magic Kingdom game, or wander the countries at Epcot playing Phineas and Ferb’s World Showcase Adventure. Relax and expect to have fun on this spur of the moment Disney trip! Let’s face it: Going to Walt Disney World is way more fun than that other thing you were supposed to be doing this week. Embrace the spontaneous energy, and make memories that your family will always cherish. Like this post? Click the images below to save to Pinterest!